Ok so after previously posting about me not being able to get my dough consistency right, it was either too dry or too wet, I finally mastered it. My next problem was that all my pizzas weren't cooking properly. Something was either over done or underdone, but I couldn't get all the elements to cook right. So today I went out and purchased a pizza stone. So I made a dough, and from the consistency of it, it was the best dough I've ever made. I rolled it out whilst my stone was in the oven heating up, then I put my toppings in. Next thing I try to move the pizza from the side to the stone and the thing just collapses all over the place, giving me something beyond repair that all had to go in the bin. What have I done wrong? Before anyone says it, yes I floured my surface before rolling out. It felt like it stuck a little bit but I didn't want to add too much flour to the surface as the dough seemed so perfect already. Obviously I know that in a proper pizzeria they have large shovels to move the pizza from a to b. Is this what I need to stop this happening or is there anything else I can do? I thought about removing the stone, putting the dough base straight on it and then adding my toppings. But surely the base will then get over done as its started cooking before anything else? Help please, because I'd bought very nice expensive Parmesan cheese and mozzarella and the full works which is now all in the bin due to it collapsing into a big mess. I can't afford to make that mistake again! Build your pizza on parchment paper, like this. You can use a baking sheet instead of a peel. I usually use a pizza peel, with corn meal to help it slide on and off. Using it makes me feel like I actually know what Im doing. I also use parchment paper and use the back/bottom of a pizza pan for sizing before I slide it onto my hot stone. I heat my oven and stone (stone is on bottom most oven rack setting) to 550F. Pizza only takes 3 - 4 minutes (thin crust) to cook. I pull the paper out before I remove pie from oven to the pizza pan to cut and serve. 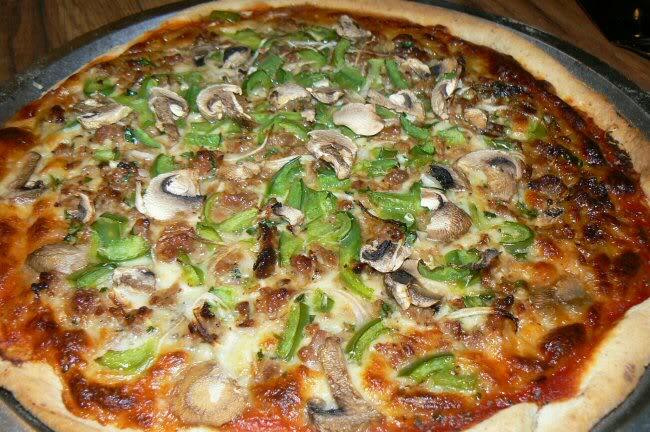 Homemade Pizza - sauce, sausage, peppers, onions, mushrooms, sliced garlic, Romano cheese, mozzarella, herbs and spices. You can buy a wood pizza peel for ten bucks. Get a box of coarse corn meal and you won't have a problem. Spread the cornmeal on the peel so the pizza will slide off onto the stone. Place the prepared she'll on the peel and build your pizza. Move the pizza on the peel to the back edge of the stone and shake it forward and back to slide it onto the stone. Excellent tutorial Andy! We use this method. Works every time. Also use the peel to rotate the pizza as it cooks. You can also use cornmeal and "build" your pizza on the back of a rimmed baking sheet if you don't have a peel. That's exactly what I do Andy. I also make a collar with a folded piece of foil around the back of the stone and tuck it under the stone before pre heating it. 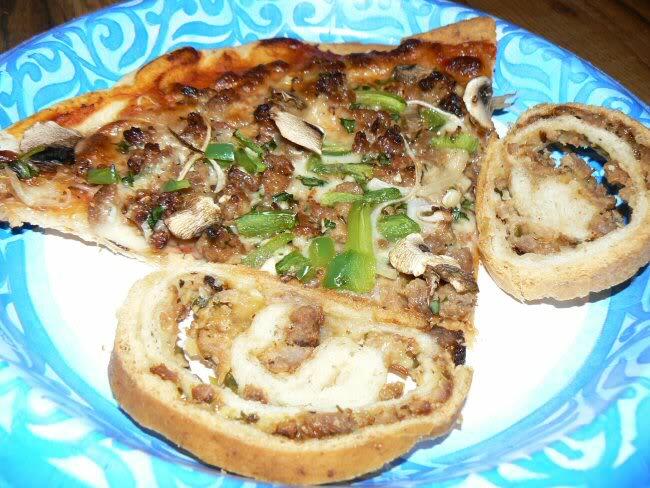 When you slide off the pizza from the Peel, it keeps the toppings from going over the back. That's what I do. I turn the pan over and use it to form/build then transfer to stone.